I’ve been working on a side project called Smidge which is a runtime JS & CSS preprocessor for ASP.Net 5. I started this late last year after the 2014 MS MVP Summit as a good starting point to deep dive into ASP.Net 5. I’ve been keeping the codebase up-to-date with the beta releases of ASP.Net 5, I have it cross compiled to both dnx451 and dnxcore50 and recently updated to use Beta 7. This week I decided to give running ASP.Net 5 CoreCLR on Linux… and the result is IT WORKS! So now dnx is installed! We’re ready to go. … which will actually work, BUT it turns out there’s a way more Linuxy way to do it. dnu publish also creates this file which isn’t in the docs: output/kestrel Having a look at this file, the first line is: #!/usr/bin/env bash … so I can only assume this is something for Linux since I’ve heard the term bash before. Turns out on Linux you can just do this in the terminal from the root of this folder! 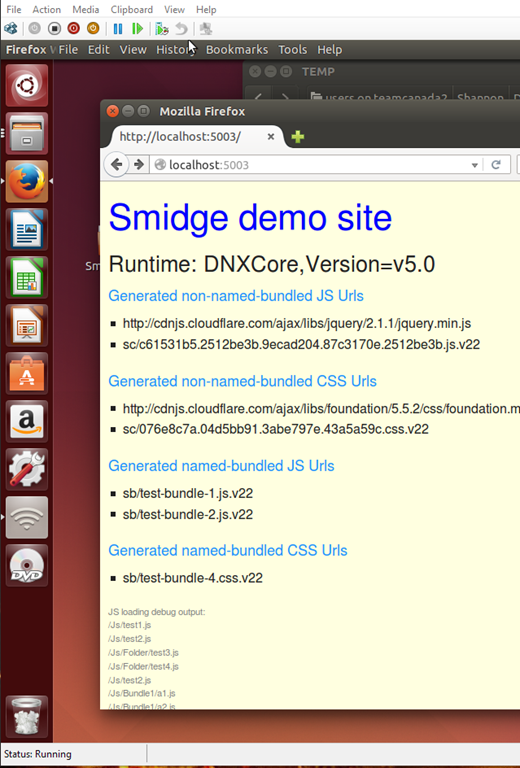 Now that it’s running, I’ll jump over to the UI in Ubuntu and fire up the browser… Tada!! I probably made the above sound a bit easier than it was ;) … I did run into a few setup issues along the way. // Add the following to the request pipeline only in development environment. // sends the request to the following path or controller action. We’re not in Windows-land anymore! The errors I was getting were due to invalid file system paths. Turns out that .Net has always had this property: System.IO.Path.DirectorySeparatorChar but there wasn’t much reason to use it since .Net only runs in Windows and that character is always backslash. So I had to change my hard coded backslash use to use this instead. Next file path issue was case sensitivity… DOH. The Smidge configuration file is: ~/smidge.json however in my c# code I was trying to load it in with “Smidge.json” which fails in Linux of course. I fixed that up and everything just worked… very freakin cool! !